About the Rainbird 200PESB 24 VAC 2-Inch Scrubber Solenoid Valve Rainbird 200PESB 2 Scrubber Solenoid Valve. 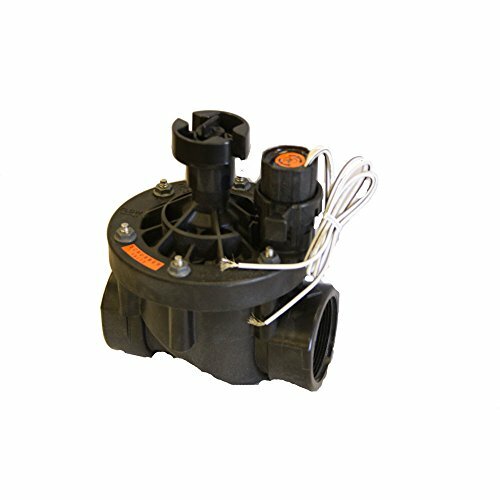 The Rain Bird 200PESB is a 2″ 24V-AC Commercial Electric Control Valve. This valve set features a durable glass-filled nylon construction with fabric-reinforced rubber diaphragm for long-lived reliability, a globe configuration, closed, forward flow design, slow closing for preventing the water hammer and subsequent system damage, and a low-flow capability for a wide range of applications. It also features a single-piece solenoid design with captured plunger and spring for easy servicing; flow control handle adjusts water flows as needed; a manual internal bleed that manually operates the valve without allowing water into the valve box, allowing the pressure regulator to be adjusted without turning the valve on at the controller first; a manual external bleed that permits flushing debris from the system, most recommended for system start up and after repairs; stainless steel studs that are molded into the body, making the bonnet more easily attached and removed with less of a chance of damaging any threads; and a nylon scrubber that scrapes a stainless steel screen to clean and break down any grit and plant material, preventing debris build-up and clogging.